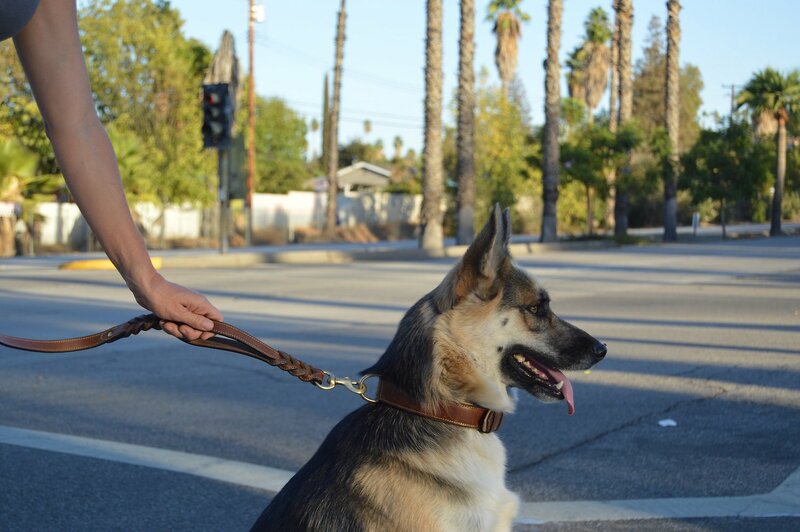 Experience the winning combination of style, functionality and durability that is the Soft Touch Collars Leather Braided Traffic Handle Dog Leash. This strong and distinctive leash is handmade and beautifully handstitched using only the finest genuine full-grain leather. Thoughtfully designed with your precious pooch’s safety in mind, a traffic loop is integrated into the braid so you can bring her in close to your side in unfamiliar situations or high-traffic areas. And because your comfort is important too, the inside of the hand loop is lined with soft, padded sheepskin leather to prevent any chafing or irritation. The unique braided design is not only beautifully crafted, it also provides exceptional strength that will stand the test of time. Solid brass hardware is lacquered to prevent rust in any weather condition. 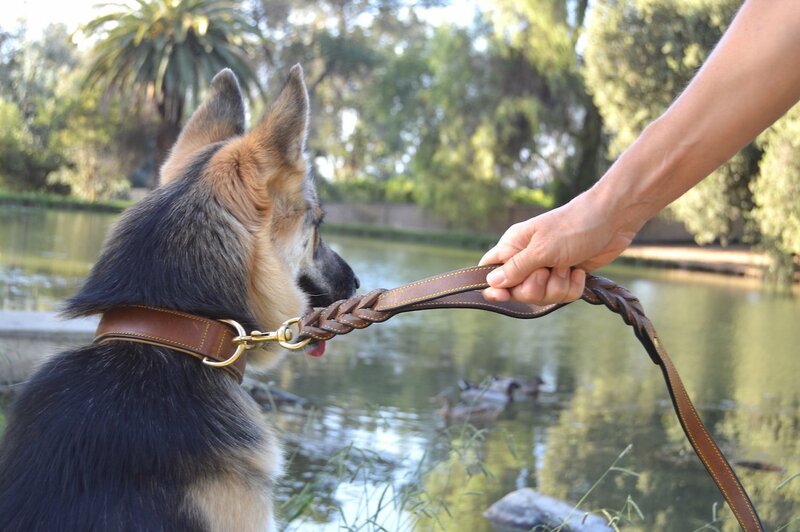 Handmade and handstitched leather leash is made from sealed-edge, supple full-grain leather for a winning combination of style, functionality and durability. Hand loop is lined with soft, luxurious sheepskin leather for maximum comfort in your hand with no chafing or irritation. The integrated traffic loop lets you draw your pup in close for maximum control in unfamiliar situations or high-traffic areas. Naturally tanned for beauty and durability and available in two colors; stylish braided design adds unique character and exceptional strength. We've never spent this much on a leash! It is worth every penny. Love the quality and strength. Great for our 110# Akita!! Really like the "traffic handle". Perfect for quickly grabbing it for many situations. I'm hooked. Love this leash. This company needs to start teaching other companies how to supply excellent quality products, convenience and amazing customer service. I have never been disappointed with Chewy.com. Perfection across the board. I ordered the 6ft, 3/4 inch and I must say this is a high quality heavy leash. I think it’s a bit too big for my 4 month old 10lb cockapoo but I’m going to keep it. Maybe it will be a better fit when he gets a bit bigger. If not, I will gift it to someone with a bigger dog. I decided to order the 4ft, 1/2 inch because I really want a nice leather leash to go with the Soft Touch Collar. This is a very nice looking sturdy leash, but if you have a smaller dog it might be too much. Purchased this in tan w the matching collar. It feels hefty and secure, looks great, and provides a good grip (nice hand feel). It will definitely last a long time. I like the 6’ length... I’ve always used retractable leashes in the past, and our doggo walks much better on this. This collar is a sure winner. This soft touch collar is perfect for our growing GSP. She loves to hold it in her mouth as we walk. It is not too hard as stated in some reviews, it's perfect and will soften more over time. So glad I found this collar. Thanks Chewy! We were very impressed with the quality of this item for such a cheap price. Very thick. Also looks very nice as well. We bought the matching collar to go with it. Thinking of buying one for my parents dog. 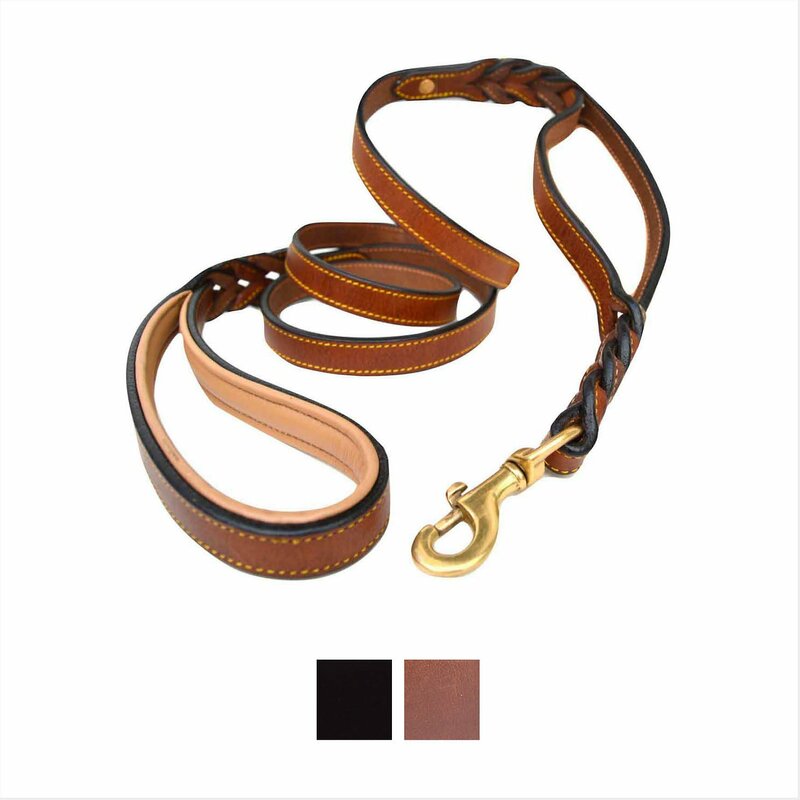 This leash is real leather that is beautifully designed and very strong. Goes great with my Boxers spiked leather collar. I guess I should have paid more attention to other reviews before buying this. It is overly stiff, even by leather leash standards. It's big and awkward looking when you try and fold up the excess length in your hand since it isn't very flexible. What a shame, because I did like the braided design. Maybe if I had gone with a smaller size it'd be more comfortable for us. This is a strong, well-constructed leash that I will definitely purchase again in another color. I have it in black as well as a matching collar that fits my dog perfectly .